The most important game in the last round took place in Manila between second ranked B-Meg Llam. (5-2) and sixth ranked Petron Blaze (4-3) on Sunday night. B-Meg Llam. was defeated by Petron Blaze on the road 92-80. It ended at the same time the five-game winning streak of B-Meg Llam.. Petron Blaze looked well-organized offensively handing out 21 assists. The best player for the winners was naturalized American center Jay Washington (206-81, college: Eckerd) who scored 29 points and 9 rebounds. American swingman Edward Basden (196-83, college: Charlotte, agency: Interperformances) chipped in 22 points, 11 rebounds and 4 assists. American forward Marqus Blakely (196-89, college: Vermont) produced 28 points and 9 rebounds for the guests. Both coaches used bench players which allowed the starters a little rest for the next games. Petron Blaze moved-up to fourth place. B-Meg Llam. at the other side keeps the second position with two games lost. Both teams do not play next round, which will be an opportunity for some rest. An exciting game between Top Four teams was played in Quezon. First ranked Rain or Shine faced 4th ranked Barako Bull. Guests from Manila (6-1) defeated host Barako Bull (3-3) 100-90. It ended at the same time the two-game winning streak of Barako Bull. 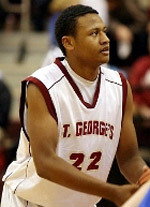 American forward Jamelle Cornley (196-87, college: Penn St.) orchestrated the victory by scoring 18 points and 6 rebounds. Gabe Norwood contributed with 15 points, 5 rebounds and 5 assists for the winners. American guard LeRoy Hickerson (196-82, college: Cumberlands) replied with a double-double by scoring 24 points, 13 rebounds and 6 assists for Barako Bull. Both coaches tested many bench players and allowed the starting five to rest. Rain or Shine maintains first position with 6-1 record. Barako Bull at the other side dropped to the fifth place with three games lost. They share the position with Ginebra Kings. Rain or Shine will have a break next round, and it should allow them to practice more before next game. Barako Bull will play at home against Talk N Text (#7) in Makati and it may be a tough game between close rivals. The most important game in the last round took place in Manila between second ranked B-Meg Llam. (5-2) and sixth ranked Petron Blaze (4-3) on Sunday night. B-Meg Llam. was defeated by Petron Blaze on the road 92-80. It ended at the same time the five-game winning streak of B-Meg Llam.. Petron Blaze looked well-organized offensively handing out 21 assists. The best player for the winners was naturalized American center Jay Washington (206-81, college: Eckerd) who scored 29 points and 9 rebounds. American swingman Edward Basden (196-83, college: Charlotte, agency: Interperformances) chipped in a double-double by scoring 22 points, 11 rebounds and 4 assists. American forward Marqus Blakely (196-89, college: Vermont) produced 28 points and 9 rebounds and center Marc Pingris (195-81) added 4 points, 11 rebounds and 5 assists respectively for the guests. Both coaches used bench players which allowed the starters a little rest for the next games. Petron Blaze moved-up to fourth place. B-Meg Llam. at the other side keeps the second position with two games lost. Both teams do not play next round, which will be an opportunity for some rest. An exciting game between Top Four teams was played in Quezon. First ranked Rain or Shine faced 4th ranked Barako Bull. Guests from Manila (6-1) defeated host Barako Bull (3-3) 100-90. It ended at the same time the two-game winning streak of Barako Bull. The game was mostly controlled by Rain or Shine. Barako Bull was better in fourth quarter 31-24. But it was not enough to take a lead and get a victory that evening. Rain or Shine made 22-of-25 charity shots (88.0 percent) during the game. 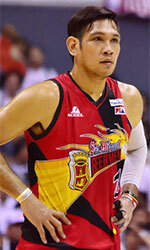 They also forced 19 Barako Bull turnovers. Strangely Barako Bull outrebounded Rain or Shine 55-31 including a 23-7 advantage in offensive rebounds. Their players were unselfish on offense dishing 21 assists. American forward Jamelle Cornley (196-87, college: Penn St.) orchestrated the victory by scoring 18 points and 6 rebounds. Naturalized American swingman Gabe Norwood (196-85, college: George Mason) contributed with 15 points, 5 rebounds and 5 assists for the winners. Four Rain or Shine players scored in double figures. American guard LeRoy Hickerson (196-82, college: Cumberlands) replied with a double-double by scoring 24 points, 13 rebounds and 6 assists and forward Douglas Kramer (193-83) added 16 points and 12 rebounds in the effort for Barako Bull. Both coaches tested many bench players and allowed the starting five to rest. Rain or Shine maintains first position with 6-1 record. Barako Bull at the other side dropped to the fifth place with three games lost. They share the position with Ginebra Kings. Rain or Shine will have a break next round, and it should allow them to practice more before next game. Barako Bull will play at home against Talk N Text (#7) in Makati and it may be a tough game between close rivals.